Depending on the day, Emily Zahran could be in court for hours or just briefly for a client’s appearance before a judge. She could visit defendants in jail or she could submit requests to keep them safe and comfortable while they await trial. On her way home from work, she might stop for dinner in bustling Dupont Circle or look up and see the President’s Marine One helicopter overhead. She does all this while earning 15 credits as a sophomore, interning for a criminal defense attorney in Washington, D.C. Thanks to the College of Arts and Science’s partnership with the Washington Center: Academic Internship program, Zahran is able to trade Green Mountain views for Capitol Hill sightings for an entire semester. The program is designed to house CAS students and place them in nearly full-time internships throughout D.C. Zahran and her classmates work Mondays through Thursdays, take a class related to their majors on Fridays and explore the city and beyond on the weekends. In between, they participate in networking receptions and other events. “This program really stuck out to me because I knew that I wanted to intern in law. Where else is better to do that than in D.C?” says Zahran, who has her sights set on becoming an attorney. Zahran assists an independent court-appointed attorney in a small firm through her internship. “It’s almost like I’m the right-hand man. Anything that he’s doing or needs help with, I’m right there for it. I get to see everything that he’s doing and even what other attorneys in court are doing,” she says. Having a front row seat to the criminal justice system in action provides Zahran insight not only into what kind of law she wants to pursue—criminal law, she’s decided—but also into issues that she might one day work to address. Many of the clients she helps defend are charged with drug- or gun-related crimes; however, she points out that there’s a blurry line between the two. Prison and jail security is another issue the internship has illuminated for her. Zahran says it’s not uncommon for fights to break out in the jails, which prompts her to file a secure location request for her clients. “I think it’s important to help people and fight for people who can’t fight for themselves. I think no matter what you’ve done, what people say you’ve done, what you’ve done in the past—no matter what it is—I think everyone deserves a right to be free of that accusation or pay for what they’ve done in an appropriate, non-excessive way,” she says. That deeper understanding, first-hand insight and career clarity is at the core of what the program aims to provide students like Zahran. Campus liaison Sophia Trigg, who oversees the Washington Center program as well as UVM’s similar Boston-based Semester in the City program, says the biggest benefit students receive is getting a truly immersive experience without sacrificing academic standing or credits. “The students are essentially entering the work force. They’ve got to take public transportation to get there on time, they really get into it and work on projects with their colleagues because they’re there for so many hours,” she says, adding that it’s an opportunity for students to try out their majors in the real world, as well. 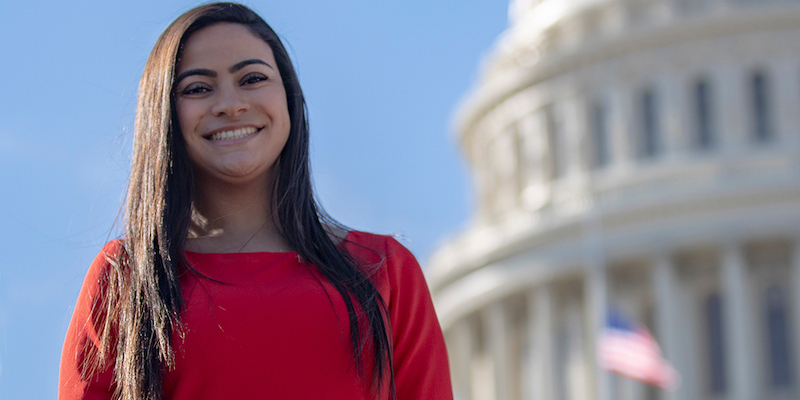 For Zahran, who plans to go to law school, testing the waters was paramount in her decision to spend the semester in D.C. “Knowing how much work, money and time law school takes, I wanted to see what being an attorney was really like. I’m not just learning about the job, I’m physically doing it,” she says.